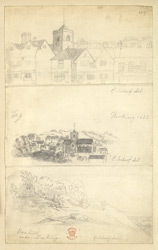 These delicate pencil drawings depict the environs of Dorking and Box Hill. Dorking lies in a narrow valley between the Greensand Hills and the North Downs. The town was mentioned in the Domesday Book, and was known as the "Manor of Dorchinges". Dorking lay on the main route from London to Brighton, and a major rail link was introduced here in 1867. The area was home to the composer Ralph Vaughan Williams and the novelists Daniel Defoe and E M Forster. Dorking's attractive landscape is still popular with walkers, and is known as an "Area of Outstanding Natural Beauty".